Acidil by Boiron always works wonders! 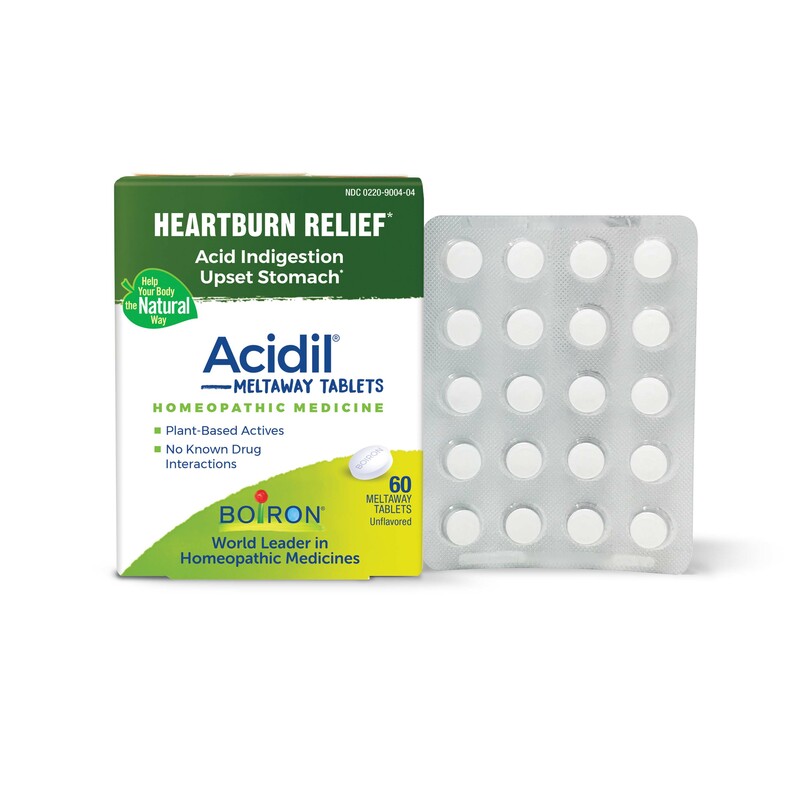 Acidil works naturally with your body to temporarily relieve occasional heartburn‚ acid indigestion‚ bloating or upset stomach. Its four natural active ingredients are the most commonly used homeopathic medicines that address these symptoms. Acidil does not cause drowsiness‚ constipation or gas. 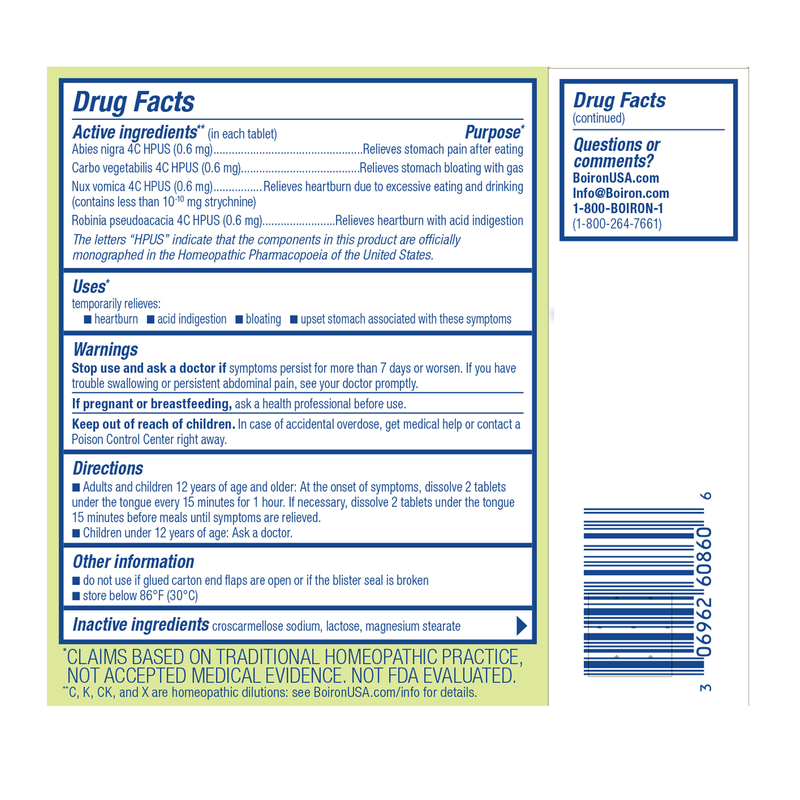 It does not interact with other medications‚ and it is not contraindicated with pre-existing conditions. Acidil does not contain aluminum hydroxide‚ which may cause constipation‚ or magnesium hydroxide‚ which may cause diarrhea. Recommended for everyone ages 12 and up. - Temporarily relieves occasional heartburn‚ acid indigestion‚ bloating or upset stomach. - Non-drowsy; No drug interactions. - For everyone ages 12 & up. - Works naturally with your body. Abies nigra 4C HPUS / Relieves stomach pain after eating. Carbo vegetabilis 4C HPUS / Relieves stomach bloating with gas. 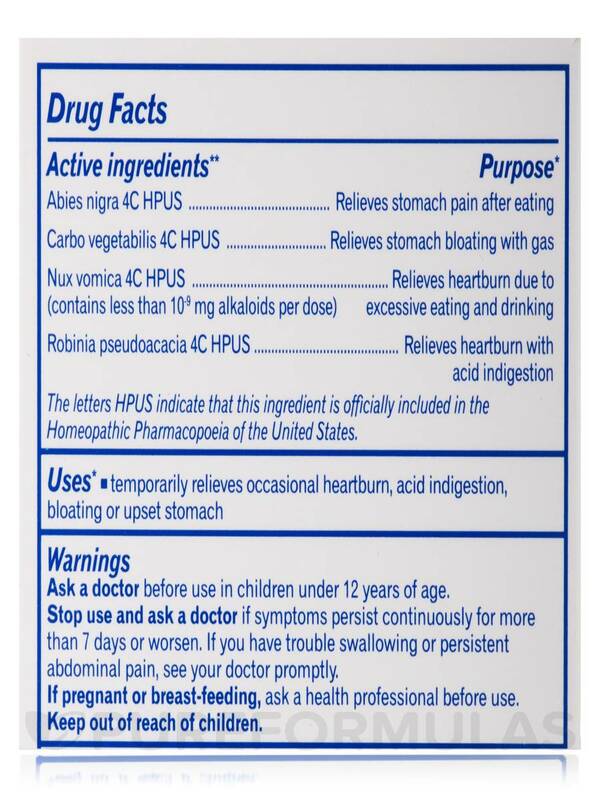 Nux Vomica 4C HPUS (Contains less than 10 mg alkaloids per dose) / Relieves heartburn due to excessive eating and drinking. Robinia pseudoacacia 4C HPUS / Relives heartburn with acid indigestion. Inactive Ingredients: Croscarmellose sodium‚ lactose‚ magnesium stearate. 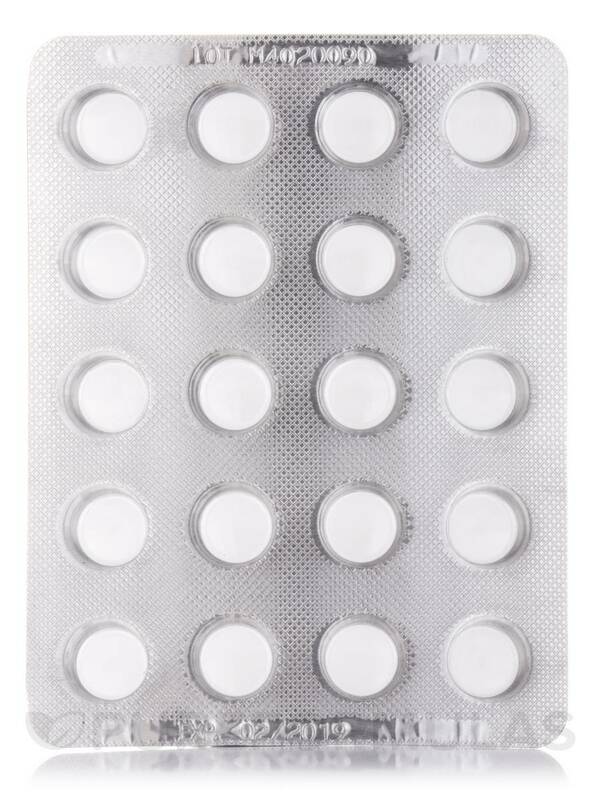 Adults and children 12 years of age and older: At the onset of symptoms‚ dissolve 2 tablets under the tongue every 15 minutes for 1 hour. 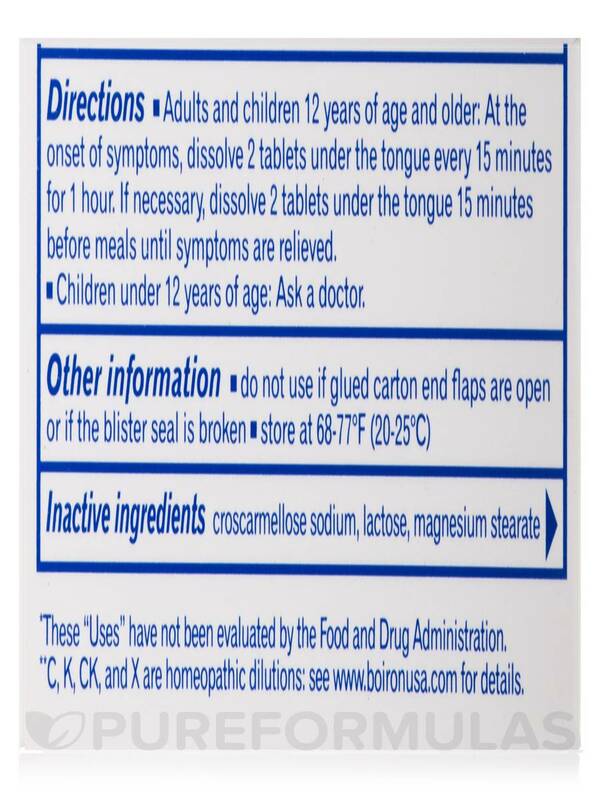 If necessary‚ dissolve 2 tablets under the tongue 15 minutes before meals until symptoms are relieved. Children under 12 years of age: Ask a doctor. Ask a doctor before use in children under 12 years of age. Stop use and ask a doctor if symptoms persist continuously for more than 7 days or worsen. If you have trouble swallowing or persistent abdominal pain‚ see your doctor promptly. If pregnant or breast-feeding‚ ask a health professional before use. Keep out of reach of children. Do not use if glued carton end flaps are open or if the blister seal is broken. Store at 68-77°F (20-25°C). Much safer and more effective than any prescription! 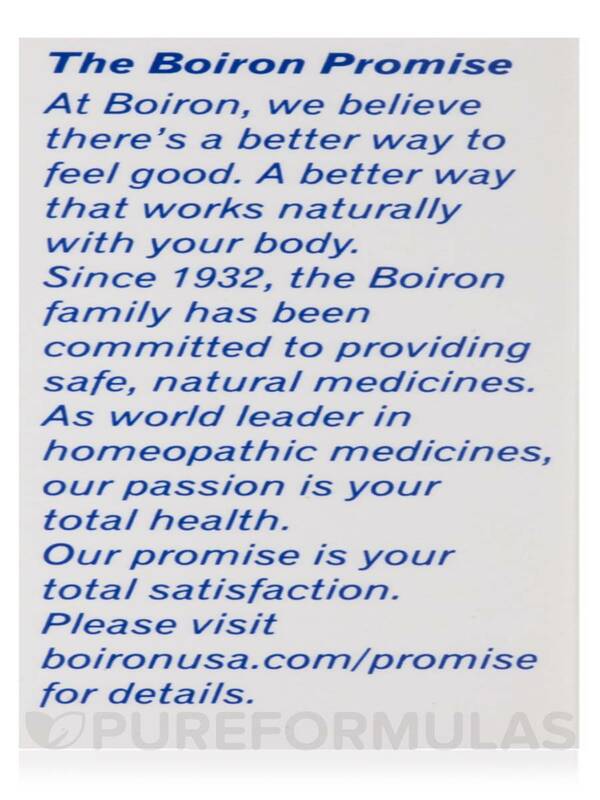 Husband said Acidil by Boiron didn't help and that actually surprised (and disappointed) me - I've had great benefits from their other products, and their ingredients are top- notch. If they don't help as they're intended to, can't really recommend. 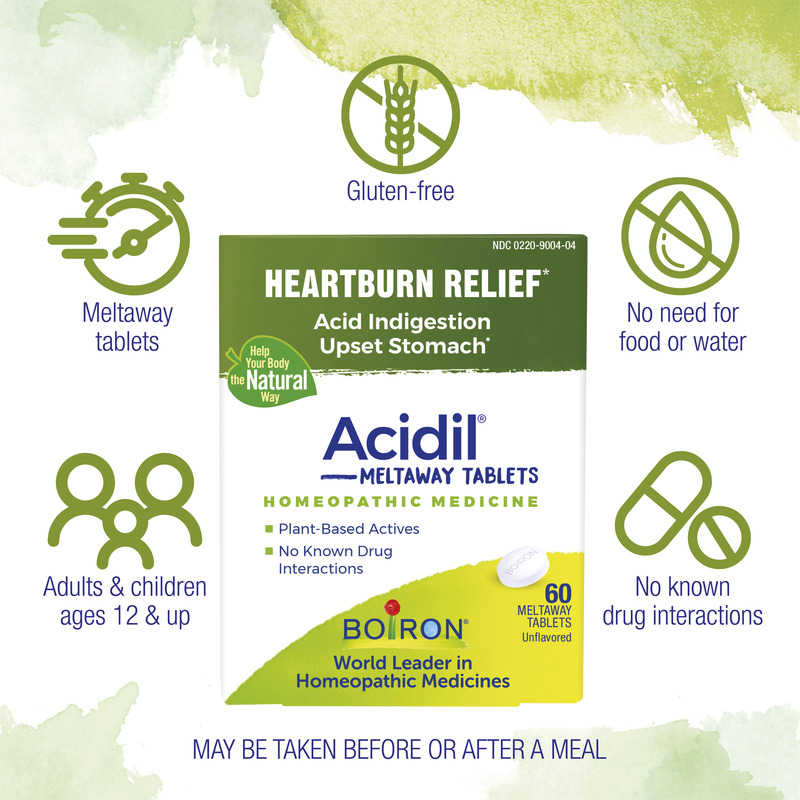 I like using Acidil by Boiron for indigestion problems after eating; it's better for my body than heartburn drugs and more natural. I have migraine-induced gastro problems and Acidil by Boiron really helps. 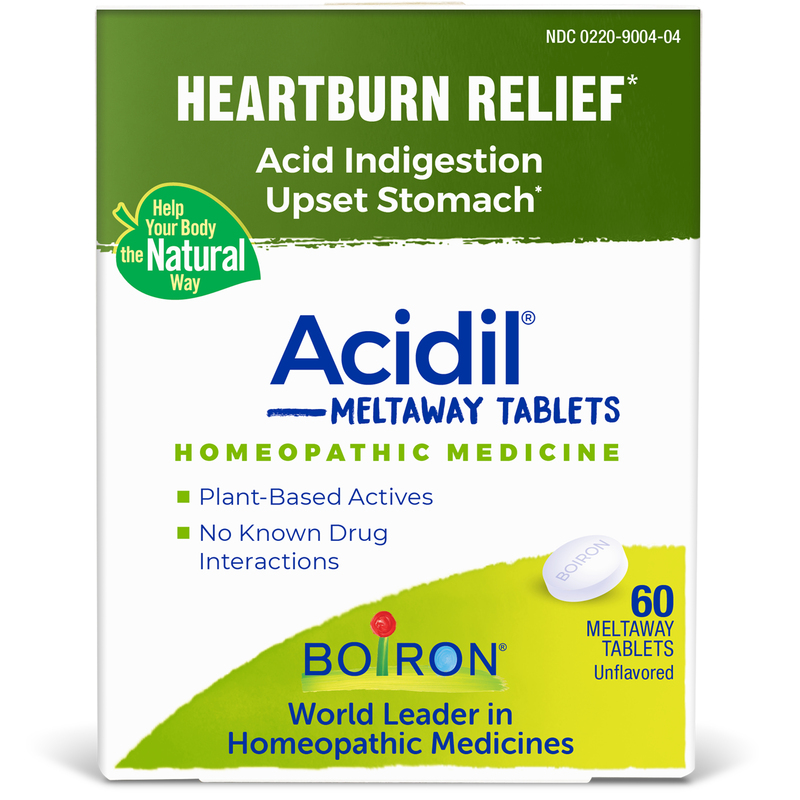 Acidil (Indigestion) by Boiron helped with several issues. Will buy again for sure for all the symptoms listed. 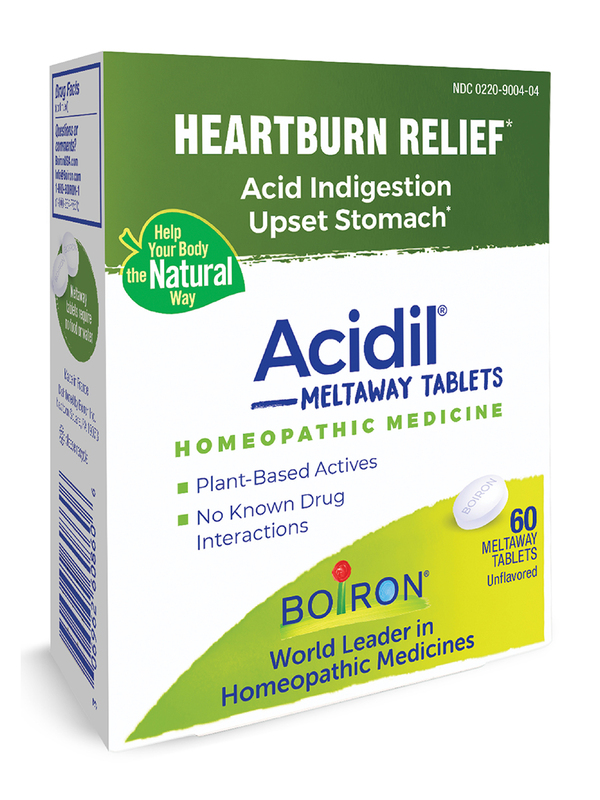 I taken Acidil (Indigestion) by Boiron as indicated on the package, up to 4 times if necessary. It always gives relief from acid reflux and sour stomach. I've been using Acidil by Boiron for many years, instead of taking prilosec. I just take the acidil when I get acid reflux. It works very quickly. If the reflux is very bad, you may have to take again 15 min. later. It's definitely healthier than taking prilosec in my opinion. 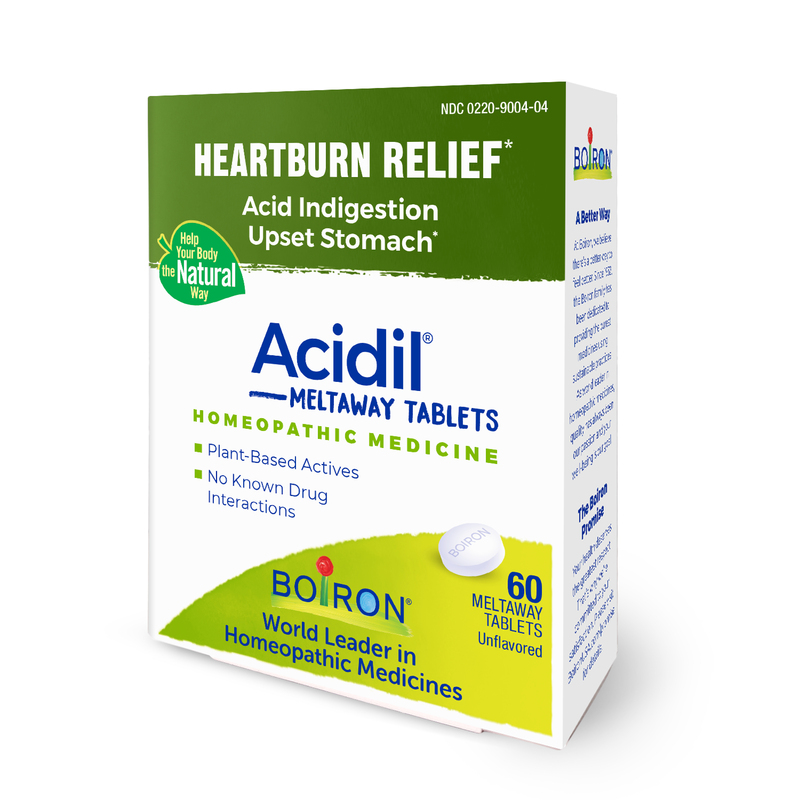 Acidil by Boiron works great when I have indigestion after or between meals. I usually have to take it a few times but I always feel better.